Yogurt is very popular and is known to be one of the healthiest dairy products as it is made from milk fermentation. The bacteria found in the milk convert the lactose into lactic acid. It is also often pasteurized to kill off the bacteria but sometimes it is not. This is the reason why yogurt is said to have live cultures in it. If you have yogurt just sitting inside your fridge for a long time, you may start wondering how to tell if yogurt is bad. There are tell tale signs of a rancid yogurt and all you need is your senses. If you really want to know the answer, keep on reading this post. Yogurt is naturally sour, almost similar to the taste of spoiled food products. With this, how do you know if you can still consume the yogurt? In this post, you will find everything you have to know about the shelf life, how to properly store them. To answer the above question, yes it does go bad. Like any other food product, it does spoil especially if not properly stored. Yogurt is a dairy product that is produced by the bacterial fermentation of milk. As mentioned above, yogurt contains live cultures that encourage a healthy environment in the intestines. Yogurt has a number of varieties and flavors such as frozen yogurt, low-fat yogurt, drinkable yogurt, Greek yogurt and yogurt with fruits. This is why it is considered a very popular dairy product around the world. It should be kept in mind that the “sell by” date indicated on the packaging of the yogurt usually means the last date in which the manufacturer will guarantee for the yogurt’s superb quality, not its safety. According to the manufacturers, the yogurt’s quality is guaranteed for up to 7 days beyond the “sell by” date. To add, manufacturers agree that the yogurt can still be consumed even after 7 days from the “sell by” date and it will still be safe. Because of this difference, you may still compliment your meals with the said yogurt and you won’t have any health concerns after consumption. Frozen yogurt can last up to three months if properly stored in the freezer. Drinkable yogurt can last up to two months inside the freezer and 10 days in the refrigerator. For Greek yogurt, storing inside the fridge can make the yogurt last for a week or two, inside the freezer, a couple of months. Low-fat yogurt can last up to two weeks if stored in the fridge and two months if stored in the freezer. For yogurt with fruits, it can last up to 10 days inside the fridge and two months inside the freezer. For regular ones, it can last three weeks inside the fridge and two months inside the freezer. In the case of yogurt that has been opened, you may limit it to a week inside the refrigerator and a month inside the freezer. This is of course, if you store them properly by tightly covering it. How Do You Store Yogurt Properly? In order to prolong the freshness of yogurt, just like any other dairy product, you have to store them in your fridge immediately after purchase. It should be kept in mind that once the package has been opened, you must consume it in a matter of days as long as it’s stored in a re-sealed foil or a tightly covered container. Moisture and other contaminants should always be kept away from the opened yogurt to extend its freshness. 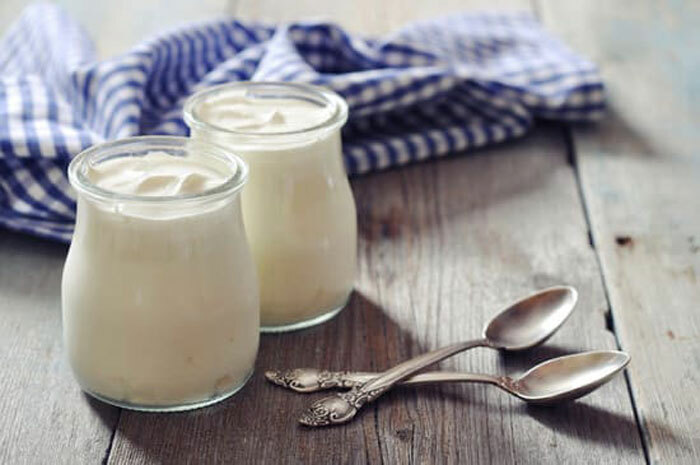 If you are planning to store your yogurt in the long term, you have to place it in the freezer for up to two months to preserve its taste and flavor. Lastly, through proper food storage, you can make sure that you eat healthier. You can also minimize waste, thus helping the environment. In addition, it cuts food costs, as storing yogurt properly will not have you make unnecessary additional purchases caused by spoiled yogurt. Determining whether the yogurt has gone rancid is a fairly simple task. The first thing to look out for is any sign of mold, fungi, or any discoloration. If you find one of those, you can say that the yogurt has spoiled and you have to throw the yogurt away. If you are a big fan of yogurt, you can definitely differentiate a fresh from a spoiled one through its smell. If the yogurt possesses a sour or any kind of foul smell, you can be sure that it has spoiled. Again, you have to discard it. You can also check its consistency through stirring it using a spoon. If the texture is not normal after you stir it, the yogurt has gone rancid. Lastly, you can do a self-check through tasting it. If it has a sour or bad taste, throw it away. Yes, yogurt can go bad. Shelf life varies depending on the type of yogurt. You just have to remember to store it properly, especially if the package has been opened. Proper yogurt storage includes storing it in the fridge immediately after purchase. For opened ones, make sure the opening is tightly sealed to keep it away from moisture and other contaminants. If the yogurt has molds, fungi or discoloration, smells foul, or tastes bad, you have to throw it away. Did you enjoy reading this article? If you have anything you want to add, please leave a comment below.